The world of TV has changed from its early dawn. The Internet now can stream TV shows from all over the world in the blink of an eye, but there restrictions that may prevent you from watching what you want. To understand what TV’s current state looks like and why geographic restrictions are put in place, let’s first start with an understanding of exactly what TV is and why its global audience is new. The technology behind the first TV sets was invented in 1873 and the world’s first TV system viable for production was created in 1907. In the late 1920s and early 1930s, many major countries like the U.S., United Kingdom and France started regularly TV broadcasts. Early TV was very primitive and faced many difficulties we no longer consider. The first baseball game broadcast only used a single camera angle. Actors in the first TV dramas actually wore black lipstick and heavy green makeup because cameras had a hard time capturing white colors. They were also less likely to melt off under the incredible heat generated by lighting. “I Love Lucy” is a great example of the early TV mindset. It was the most popular show on TV in its second season, the 1952-1953 season, and this prompted CBS to create a pilot for a radio version of the show. The radio pilot episode was created by simply editing the soundtrack for an existing TV episode, but it was never aired. This can be seen as the turning point for TV overtaking radio. The first regular TV program broadcast in the United States was on July 2, 1928. The medium experienced slow growth for the next roughly 20 years. In the late 1940s, TV began to take off in the United States as big radio broadcasts began to create TV counterparts and new shows took to the medium. NBC, CBS and ABC were national networks, but most content was prerecorded and created in New York City. Americans had only 6,000 TV sets in 1946, but this rose to 12 million in 1951 and reached more than half of all American homes by 1955. In 1964, color broadcasting finally reached prime-time television. No technology before or since has become a standard of the American home faster than black-and-white TV sets. Baird Television used the BBC radio transmitter to make the first U.K. TV broadcast in September 1929, and Baird provided minimal programs five days each week through 1930. Two years later, the BBC launched its own regular service using two new broadcast systems. The BBC slowly ramped up content until World War II. The BBC suspended broadcasts on Sept. 1, 1939, at 12:35 p.m., directly after a Mickey Mouse cartoon. Broadcasts resumed on June 7, 1946, and even showed the same cartoon. At the end of the 1940s, there were more licensed TV receivers, which included sets in bars, in the U.K. than there were in the United States. France did not begin testing TV broadcasts until the 1930s with the first public broadcast happening in April 1931. The first official French TV channel launched in February of 1935, and later broadcasts were given a larger range thanks to a broadcast transmitter located atop the Eiffel Tower. In 1939, France entered the war and stopped its broadcasts. The transmitter on the Eiffel Tower was also sabotaged that year. In 1940, the German occupation seized French TV stations and began to broadcast their own content. French-controlled TV broadcasters returned with the liberation of Paris in 1944 and the Eiffel Tower transmitter was repaired in 1945. It wasn’t until 1964 that French television added a second channel and the country continued to struggle with private- and government-run monopolies until the early 1980s. Television today is smarter, more stylish and better made than ever before. In fact, many commentators have referred to the glut of quality programming currently available as peak TV. From traditional broadcast networks to online streaming platforms, there is no shortage of options for those weekends when you just want to stay in and binge-watch your favorite shows. 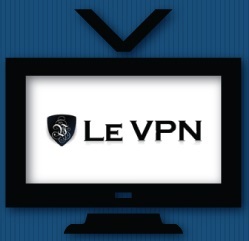 Plus, with VPN services such as Le VPN, it’s easy to explore top TV shows no matter where in the world you’re located. 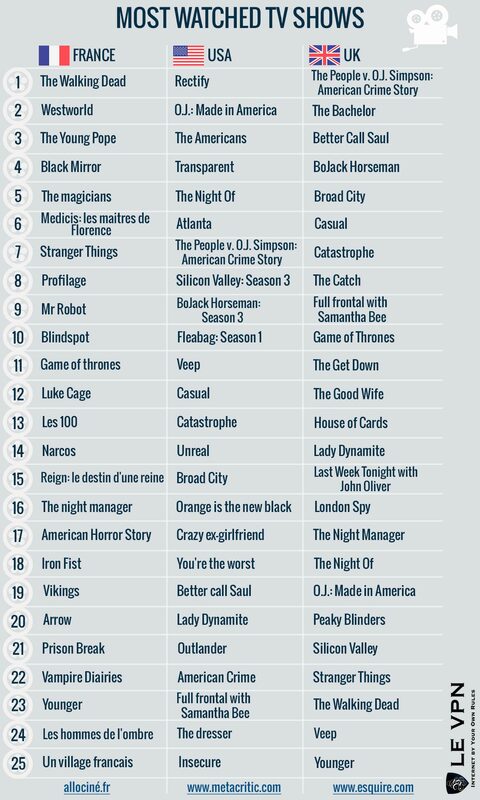 Popular favorites: In the 2015-2016 television season, gory zombie survival epic “The Walking Dead” (AMC) continued to dominate among Americans aged 18-49. This was followed closely by Fox’s hip-hop soap opera “Empire.” Other recent ratings hits have included perennial favorite “The Big Bang Theory” (CBS), HBO’s “Game of Thrones” and the revived “X-Files,” which returned to Fox in January 2016 with a short run of six new episodes. Critical darlings: Looking for something a little outside the mainstream? The final season of SundanceTV’s off-the-radar “Rectify” currently tops Metacritic.com with an unprecedented critical score of 100. Other left-of-the-dial shows worth checking out include Amazon Instant Video’s drama-comedies “Transparent” and “Fleabag,” FX’s “Atlanta” and Netflix’s anthology series “Black Mirror.” All have won critical praise and a devoted cult following among TV fans. Sports: In the U.S., you can always count on the Super Bowl to be one of the most-watched sporting events of the year. Likewise, during the regular season, “” (NBC) and “NFL Thursday Night Football” (CBS) continue to lead the ratings. Internationally, the quadrennial and Summer Olympics are always major draws, as is the ICC Cricket World Cup Championship. TV en Español: Looking to stay up to date on the latest TV hits from Latin America? Online streaming services like Univision NOW have made Spanish-language TV more accessible than ever. In addition to dubbed versions of popular American and European shows, you’ll also find great original programming such as “Club de Cuervos” (Netflix), “Amor Bravío” (Televisa), “La Sonata del Silencio” (La 1) and more. International hits: Why not expand your horizons even further by exploring TV from around the world? A wide range of critically acclaimed international series are available for download or streaming – many of which are even subtitled for your convenience. Be sure to check out Italian crime saga “Gomorrah” (Sky Italia), risqué teen drama “Skam,” a huge success for Norway’s NRK network, or Germany’s historical spy thriller “Deutschland ’83” (RTL). Whatever your tastes, there’s a world of great TV out there for you to explore. Keep reading to learn how a VPN service can make it more accessible than ever. Broadcasters pay for TV shows or the rights to show them and then sell their broadcasts to pay-TV providers such as cable and satellite companies. Because companies are willing to pay more for exclusives, many deals restrict how and where TV content can run. The largest type of restriction is a window that prevents TV content from showing up in countries outside of its origin. Restrictions vary for these services and the easiest way to figure out what isn’t allowed is to try to stream content from any source. Netflix, for example, is available throughout the Americas but has limited availability in Europe. People in the U.K. can subscribe to the service and watch to their heart’s content, but French consumers are presently shut out. The easiest way to watch TV and movie content that is region-restricted is to use a virtual private network (VPN) service. A VPN will allow you to access a server in your country or another, so you can appear to be located in the country of origin for the show you want to watch. Legally watching movies online with a VPN still requires you to pay for the content or the service that delivers it, so you may not be violating any terms of service by using a VPN to appear to be located in another country. When using a VPN to circumvent geographic restrictions, remember that you’re not safe from conducting illegal activities. Your VPN can and will report you to the authorities for breaking laws of the country it is located in. A VPN will give you a secure connection for all of your operations and it presents you with an IP address. You can access the VPN from wherever you are, which means a U.S. customer can still legally watch HBO content in France or a British traveler who heads overseas can still watch BBC and iPlayer content without breaking any rules. The best option for you is to pick a VPN service like Le VPN, which has servers in 114 countries and is now including a Smart DNS service with our VPN subscriptions. SmartDNS by Le VPN allows you to switch between IP addresses in the US, UK and France to watch the most popular TV channels in those countries without having to make adjustments to your PC or other devices. Le VPN created the product as an add-on to its VPN service so you only need to set up the SmartDNS on your device once and it will work automatically on all the channels supported by Le VPN. From the BBC’s iPlayer to the U.S. NBC, you can enjoy the channels of three different geographic regions at the same time without any additional configuration. SmartDNS works not only on computers, laptops and mobile devices, but also on smart TVs, game consoles and routers that unblock TV channels on all the devices connected to that router’s WiFi. The service also provides a speed boost just for watching videos by removing some of the normal encryption hurdles of a regular VPN service. Using a specialized DNS service made just for video is the perfect way for TV lovers across the globe to access their favorite shows.